Guillem Bauza scored on his Exeter debut as they beat Yeovil in the Carling Cup first round. The Spaniard came on a substitute and missed the target from distance before firing a shot against the post. But after the break he got his goal, latching onto Nicholas Bignall's pass 12 yards out and slotting home. Chris Shephard sealed the win three minutes into stoppage time when he converted Tom Nichols' cross from inside the area. "I thought the performance was better but we need to make sure we are not so open - it's about getting that balance right. "We've got to get in there. A few people are a bit tense and nervous and all we need is that final ball. "What we can't afford to do is get too negative." 90:00+4:51 The referee blows his whistle to end the game. 90:00+3:16 Assist on the goal came from Tom Nichols. 90:00+3:16 GOAL - Chris Shephard:Exeter 2 - 0 Yeovil Goal scored by Chris Shephard from deep inside the penalty box to the bottom left corner of the goal. 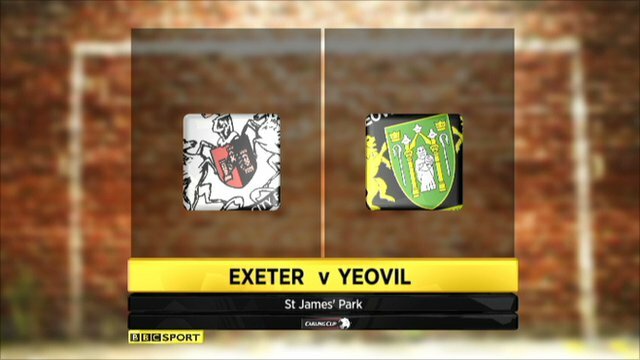 Exeter 2-0 Yeovil. 90:00+2:10 Curtis Haynes-Brown is penalised for handball and concedes a free kick. Artur Krysiak takes the free kick. 90:00+1:04 Curtis Haynes-Brown concedes a free kick for a foul on Steve Tully. Artur Krysiak takes the free kick. 87:33 Chris Shephard challenges Paul Wotton unfairly and gives away a free kick. Free kick crossed by Gavin Williams, Troy Archibald-Henville makes a clearance. 87:01 Foul by Tom Nichols on Gavin Williams, free kick awarded. Gavin Williams takes the free kick. 86:40 Liam Sercombe challenges Jed Steer unfairly and gives away a free kick. Jed Steer restarts play with the free kick. Correction - 85:10 Jonathan Obika has an effort at goal from just outside the box which goes wide of the right-hand post. 85:10 Shot from just outside the area by Tom Nichols misses to the right of the target. 84:26 Jonathan Obika is ruled offside. Free kick taken by Artur Krysiak. 82:33 Liam Sercombe concedes a free kick for a foul on Gavin Williams. Gavin Williams crosses the ball in from the free kick, Troy Archibald-Henville makes a clearance. 81:19 Outswinging corner taken right-footed by Gavin Williams from the right by-line, Artur Krysiak fouled by Paul Huntington, the ref awards a free kick. Direct free kick taken by Artur Krysiak. 79:25 Paul Wotton concedes a free kick for a foul on Tom Nichols. David Noble takes the direct free kick. 77:46 Substitution Anthony Edgar leaves the field to be replaced by Steven MacLean. 76:39 Inswinging corner taken right-footed by David Noble from the left by-line. 75:56 Free kick awarded for an unfair challenge on Kieran Agard by Richard Duffy. Paul Wotton restarts play with the free kick. 75:07 Substitution Tom Nichols is brought on as a substitute for Nicholas Bignall. 67:50 Substitution (Yeovil) makes a substitution, with Jonathan Obika coming on for Rory Fallon. 67:21 Liam Sercombe takes a shot from close range clearing the crossbar. 65:14 Substitution (Exeter) makes a substitution, with Callum McNish coming on for Guillem Bauza. 65:04 Chris Shephard has an effort at goal from just inside the box that misses to the right of the goal. 63:00 Assist on the goal came from Nicholas Bignall. 63:00 GOAL - Guillem Bauza:Exeter 1 - 0 Yeovil A goal is scored by Guillem Bauza from inside the box to the bottom right corner of the goal. Exeter 1-0 Yeovil. Correction - 61:11 David Noble gives away a free kick for an unfair challenge on Edward Upson. Gavin Williams sends in a cross, Paul Huntington takes a shot. Richard Duffy makes a clearance. 61:11 Unfair challenge on Edward Upson by David Noble results in a free kick. Free kick taken by Gavin Williams. 59:43 Shot from just outside the area by Liam Sercombe misses to the left of the target. 58:10 Substitution Kieran Agard joins the action as a substitute, replacing Andrew Williams. 57:21 Andrew Williams produces a right-footed shot from just outside the area that goes wide left of the goal. 56:24 Free kick awarded for an unfair challenge on Chris Shephard by Paul Wotton. Direct free kick taken by David Noble. 54:16 Nicholas Bignall takes a shot. Blocked by Jed Steer. Outswinging corner taken right-footed by David Noble played to the near post, Paul Wotton manages to make a clearance. 52:52 Anthony Edgar challenges David Noble unfairly and gives away a free kick. Direct free kick taken by Troy Archibald-Henville. 52:39 Free kick awarded for a foul by Gavin Williams on Scott Golbourne. Scott Golbourne takes the direct free kick. 51:56 Nicholas Bignall is caught offside. Indirect free kick taken by Jed Steer. 48:59 David Noble takes a corner. 48:39 Foul by Rory Fallon on Scott Golbourne, free kick awarded. Artur Krysiak restarts play with the free kick. 45:00+2:06 The players leave the pitch at half time. 45:00+1:39 Liam Sercombe concedes a free kick for a foul on Luke Ayling. Paul Wotton restarts play with the free kick. 44:26 Foul by Guillem Bauza on Gavin Williams, free kick awarded. Gavin Williams restarts play with the free kick. 43:19 Paul Wotton fouled by Nicholas Bignall, the ref awards a free kick. Jed Steer takes the direct free kick. 41:25 David Noble challenges Edward Upson unfairly and gives away a free kick. Jed Steer takes the free kick. 40:46 Andrew Williams takes a shot. Artur Krysiak makes a save. 38:45 Handball decision goes against Rory Fallon. Free kick taken by Troy Archibald-Henville. 36:02 Outswinging corner taken by David Noble, Shot from deep inside the area by Richard Duffy goes over the bar. 35:25 David Noble takes a inswinging corner from the left by-line played to the near post, clearance made by Paul Huntington. 34:13 Header by Nicholas Bignall from deep inside the penalty area misses to the left of the goal. 28:48 Guillem Bauza takes a shot from a just insdie the area and hits the post. 28:16 Foul by Edward Upson on Chris Shephard, free kick awarded. Free kick crossed by Chris Shephard. 24:54 Shot by Guillem Bauza from outside the box goes high over the target. 23:52 Outswinging corner taken by Gavin Williams from the right by-line. 22:53 Unfair challenge on Steve Tully by Gavin Williams results in a free kick. Free kick crossed right-footed by David Noble, save by Jed Steer. 21:11 Substitution Guillem Bauza joins the action as a substitute, replacing Richard Logan. 20:17 Paul Huntington takes a shot. Artur Krysiak makes a save. 19:40 Free kick awarded for an unfair challenge on Gavin Williams by David Noble. Gavin Williams takes the direct free kick. 17:13 Effort on goal by Richard Logan from inside the box misses to the right of the target. 16:04 Unfair challenge on Edward Upson by James Dunne results in a free kick. Gavin Williams takes the direct free kick. 14:55 Corner taken by David Noble from the left by-line, Gavin Williams fouled by James Dunne, the ref awards a free kick. Direct free kick taken by Jed Steer. 14:12 Andrew Williams produces a left-footed shot from deep inside the penalty area which goes wide of the left-hand post. 8:41 Unfair challenge on Luke Ayling by Liam Sercombe results in a free kick. Jed Steer restarts play with the free kick. 5:29 Gavin Williams handles the ball and concedes a free kick. Strike on goal comes in from Chris Shephard from the free kick, save made by Jed Steer. 4:22 Free kick awarded for a foul by Chris Shephard on Anthony Edgar. Nathan Jones takes the free kick. 3:28 Corner taken by David Noble from the right by-line, Paul Wotton manages to make a clearance. 0:12 Foul by Gavin Williams on Liam Sercombe, free kick awarded. The free kick is swung in right-footed by David Noble, clearance by Steve Tully.